SX2 victor on Geelong's third round of AUS Supercross. 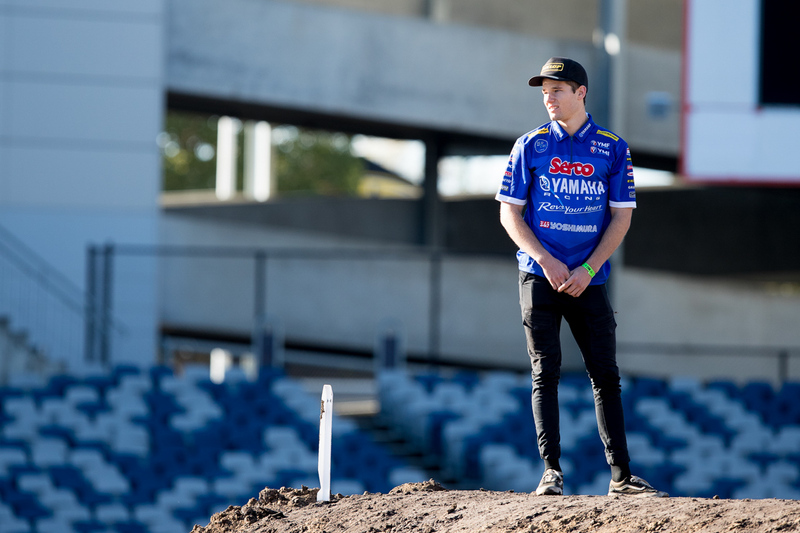 Wilson Todd’s consistency in Saturday’s newly-introduced Triple Crown format at Geelong’s third round of the 2018 Australian Supercross Championship was ultimately rewarded with victory in the SX2 category. 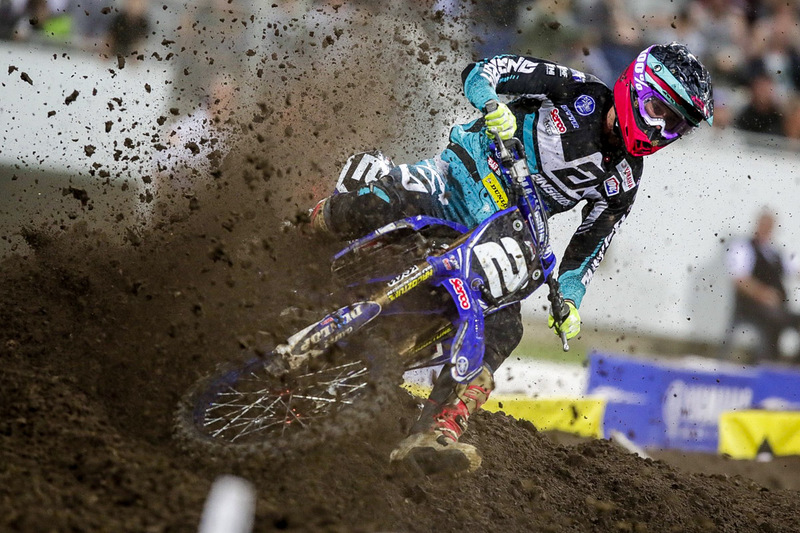 The Serco Yamaha ace lodged a 1-6-3 scorecard for top honours, promoting him to second in the championship standings. Yeah, of course I’m pleased. I started the year slow and wasn’t too prepared for it, but things have been getting better and I can see some progress. The Triple Crown format is new to the championship this year, how did you find the three 10-lap main events? I didn’t mind it – I guess if you asked the same question and I got three bad starts, I’d probably hate it. But, I got three pretty decent starts, so I wasn’t too fussed about it. It’s just really how it works out for you on the night – if you’re up front, the short races are really good if you don’t make any mistakes, but if you’re starting at the back, you’re going to really struggle. Did you find the intensity or aggressiveness throughout the field was greater because of the shorter mains? I think for some of the other riders, maybe. For myself, I didn’t really ride too hard because I knew a mistake would be a costly one with such short races. I just rode in my comfort zone and kept it up on two wheels the whole time. I got passed by a few guys, but I wasn’t putting it all on the line to get them back or anything – I knew in the back of my mind that trying to do something like that could end up much worse. I just didn’t ride over my head and cruised around comfortably. GMHBA Stadium is an incredible facility and a large one at that, describe to me what it was like to race inside an AFL stadium in front of a pretty large crowd. For me, when I’m in the stadium and riding, I almost don’t even see the crowd – I don’t really take notice that I’m in a stadium – I’m looking ahead at the track. You can see it in your peripherals, but you don’t really think about it when you’re riding – I’m just focused on what’s ahead of me. One of the best things about it was the lighting – the track was so well lit up compared to anywhere else we’ve been on a night round aside from the indoor places. You could definitely feel the vibe when you were on the line, which was pretty cool. You’re second in the championship with two rounds to go, what’s the plan of attack from here? There’s not too much of a plan of attack other than to get the best result that I can. I’m always trying to get good starts, be up front and win races. I can’t control what Jay [Wilson] or anyone else does around me – I can’t determine their results, I can only determine mine. Whatever the result is at the end, is what it is.